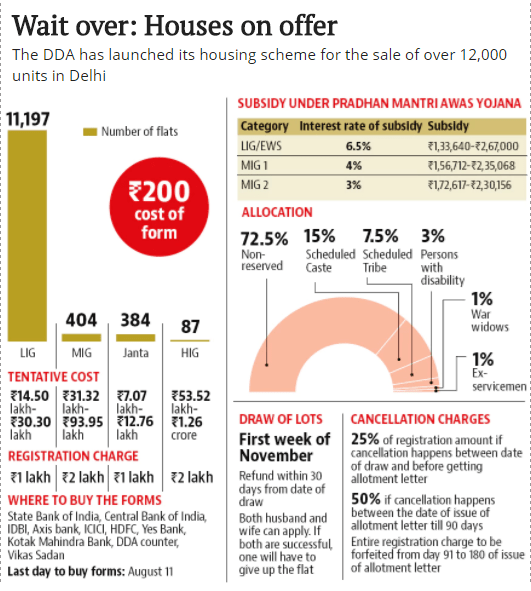 Delhi Development Authority (DDA) has announced that under this schemes there are 12, 069 flats on offer where 87 are high-income group (HIG) flats, 404 are two-room middle income group (MIG) flats. The rest 11197 are one-bedroom lower income group flats (LIG) flats and 384 janta flats. Majority of these flats are located in the area Rohini, Dwarka, Narela, Vasant Kunj and Jasola. Approximately cost of these flats will be Rs 53.52 lakh and Rs 1.2 crore for HIG, Rs 31.32 lakh and Rs 93.95 lakh for MIG. For LIG one has to pay between Rs 14.50 lakh and 30.30 lakh and for Janta flats one has to shell out between Rs 7.07 lakh and Rs 12.76 lakh. This year DDA Housing schemes 2017 is linked with Central Subsidy schemes where interest will be provided under PMAY in eligible cases after getting the bank loan. Forms and brochures will be available in select branches of banks in Delhi till August 9. Submit the duly filled Application Form to above mentioned designated bank along with registration amount. This year onwrd DDA has introduced the penalty system in surrendering the flats. If a prospective buyer surrenders his application before the date of draws, no money will be deducted from his or her registration fee. If a buyer does so after the draw but before the issue of a demand letter, 25 per cent of the registration fee will be forfeited. If the flat is surrendered within 90 days of the issue of the demand letter, 50 per cent of the fee would be cut. “Beyond that time period, the entire registration fee will be forfeited,” he said. Under the rules, a husband and a wife can apply for the scheme but if both get an allotment, one of them will have to give it up.